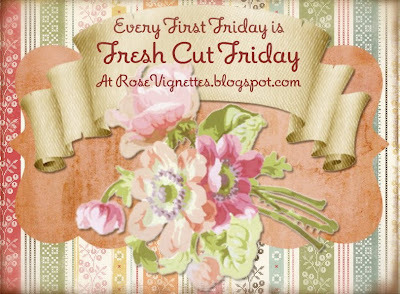 I am joining Liz @ Rose Vignettes for Fresh Cut Friday. Be sure to visit her and see all of the gorgeous bouquets everyone has arranged. 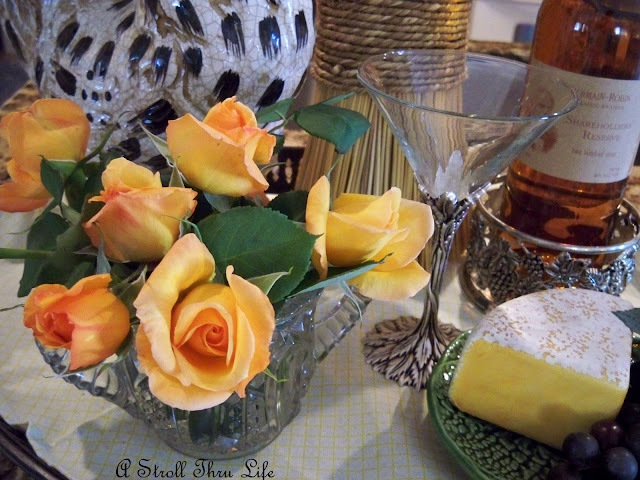 My yellow rose bush has finally started to bloom and so I just had to cut some buds and bring them into the house. Yellow roses are my most favorite flower ever. I adore them. 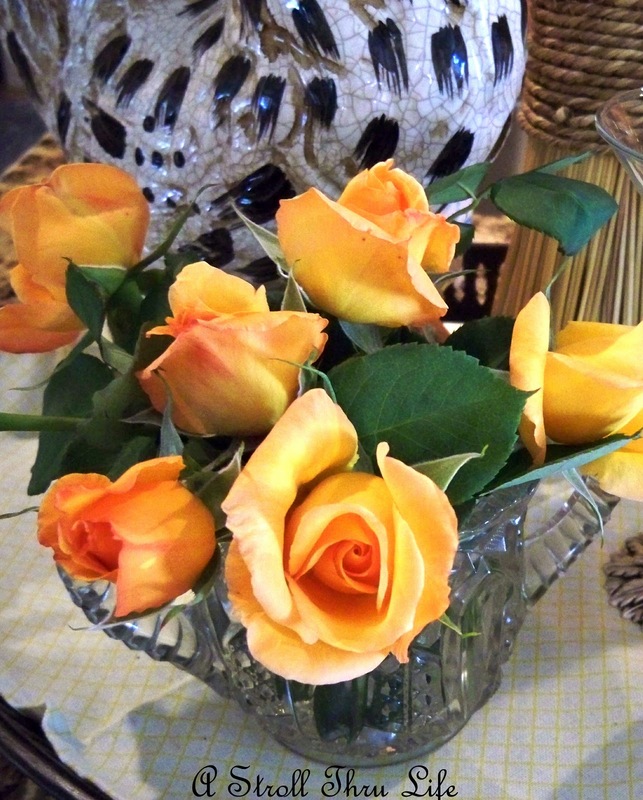 These roses are such a beautiful color with bright yellow and a little bit of peach on the tips. Just a few snips of buds placed in an antique pressed glass sugar bowl, but how happy it looks when you pass by. Your roses are beautiful, Marty! I have roses that I just love, too, and can't wait for them to bloom. Things are going slowly here. I think the snow has thrown all the plant life off! Those roses R so beautiful. Your roses are so lovely Marty! They make a gorgeous bouquet! Wow, Marty, these roses are gorgeous. 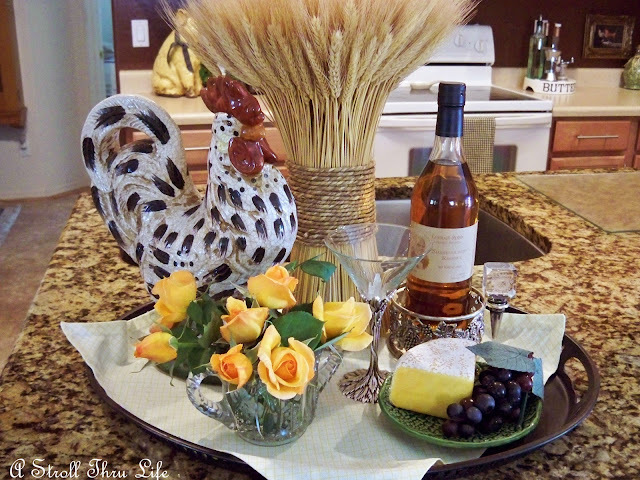 So is your tablescape! Yellow roses are my favorite and these are just perfect. Marty, I love your roses with the peach tips. Do you know the name of them? I have a yellow one called "Teasing Georgia" but it's no where near ready to bloom yet. Thanks for sharing your beauties. I generally say pink roses are my favorite, however I think I have been fooling myself. I love all roses! Your yellow roses are gorgeous! Marty, that color is just scrumptious. HEY! Those are gorgeous! I still don't have any blooms....TONS of buds though. THANK YOU THANK YOU THANK YOU! for joining for Fresh-Cut Friday. I did end up using my new ginger jar. It is perfection!!! :) Thanks for that too! I have always loved yellow roses too, Marty. It looks like there is a little bit of soft peach around the edges. How beautiful they look in your vignette. My Grandmother Sue loved yellow roses. The peace rose was a bush near her porch. Every Mother's Day...in perfect timing. .. they would bloom. MoMa and I would always cut and arrange them in a tall, slender crystal vase for the dining table. Your roses reminded me of those days gone by. I smiled. Thank you, dear friend! Enjoy your roses! Yellow roses were my mom's favorite too! They are so beautiful...but then, what rose isn't?? Just beautiful! They remind me of my father's garden. Hi Marty! Your roses are gorgeous and the color is so pretty! Now you've got to come over to my blog as I have a surprise for you! Lovely! My roses are not blooming yet. I pruned them so late this year, but I hope to see them soon. Yours are just gorgeous. Such wonderful color in those roses! You're so lucky! Your roses are beautiful! Being from Texas originally, I am rather partial to yellow roses! You asked about the yellow cache pot in which I had all my yellow flowers. 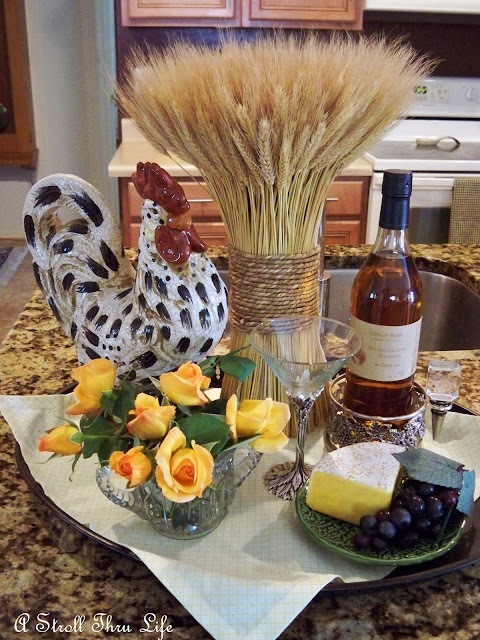 I used to own a home decor shop and the individual stems and the container were for sale. I think customers thought that it was all sold together, because they didn't sell. I was secretly thrilled because that meant I could take it home! I AM PRETTY CERTAIN from my Mom's flower shop owning days, that Yellow roses means friendship, so what a perfect arrangement!!! Those are so pretty Marty! And of course you go and create a gorgeous vignette! What a delightful vignette, your roses are gorgeous. I am so envious despite all my beautiful daffodils, it will be some time before our roses are in bloom. Oh love the yellow roses. My favorite color. I sent you an e-mail thanking you for the feature but was using my daughter's laptop so I wasn't sure if it went through. I sure hope it did. Thanks again!! Marty your roses are beautiful and for some reason you sort of remind me of a yellow rose too. They are a perfect fit for you and your personality! Beautiful! Yellow roses were my father's favorite flower so he always bought them for my mom for special occasions. The pop of bright color always cheers up a room. Also, I was wondering how your hunt themed guest bedroom plans were coming along. Oh my gosh! Look at those roses!! Nothing here yet, still brown! Beautiful roses..so bright and happy. Wonderful flowers..so bright and happy.